Email marketing is an indispensable part of B2B marketing strategies. It can be a powerful tool if used intelligently to catch people at the right moment with the right message. Email marketing campaigns build relationships with business prospects, gather important data and improve marketing returns on investment. To conduct successful email marketing campaigns, B2B businesses must pay attention to their audiences and avoid obvious self-promotion. In addition to today’s high expectations, there are a few differences between B2B and B2C email campaigns, which if not considered, can jeopardize potential sales and leads. 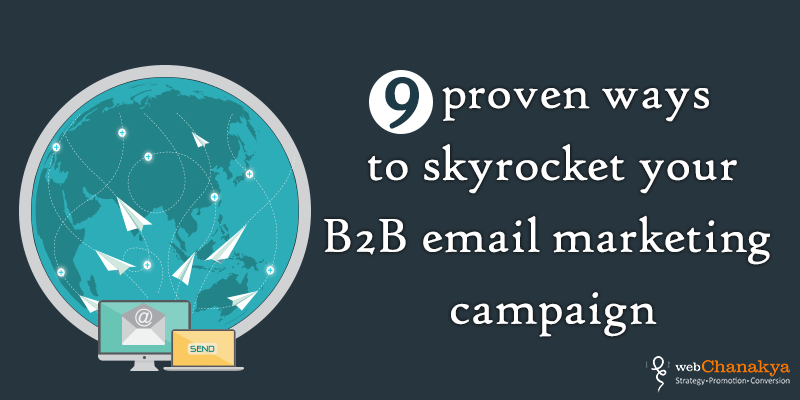 So how can you make your B2B email marketing efforts more effective? We view the email itself as an experience rather than simply a marketing message, so those customers who take the time to open the email have a fun and engaging experience. This leads to extreme increases in click through rates than the traditional campaigns. Simply presenting an incentive in a better way and always looking for ways to enhance the customer experience in the email is a win-win situation for the consumer and the business. Ask yourself, if I were receiving this email, would I read it or delete it? If your email doesn’t include interesting or useful information to your recipient then delete it and try again. We all receive tons of emails per day from people beseeching us for their product; unless an email is of use, it is thrown. "Batch and blast" is a popular email marketing method. This approach involves collecting email contacts and blasting all of them with email messages. Unfortunately, this does nothing to start a dialogue with business prospects. Successful email marketing encourages meaningful conversations. Just do not beat around the bush about your services and product. Be pertinent with the information you are providing in the content. It should not be specifically related to product or services, you can also provide information associated with technical specifications, customer reviews, feedback and so on. Directly get straight to the point. Don’t make your readers stride through facts. Avoid beginning your emails with a yes or no question unless it sells the offer and highlights what the reader will want. Be specific and tangible. State benefits in action-oriented terms. Make sure you sell the offer, not the product. Describe the offer in terms that will appeal to someone experiencing issues that your solution can solve. Email campaigns are more than simple communication; they share a message about a product, service, business or brand. Successful businesses use these campaigns to modify their email messages according to prospects' profiles, behaviours and interests. It is acceptable to send different emails to different segments of an email list, and automation solutions free up time for relationship-building. Ask questions like what is it you want your recipient to do? If you want them to download a document or a link or an image. There should be one offer and one call to action. Repeat the call to action 2-3 times at maximum and include both text links and buttons. Testing and analysis are essential for B2B email marketing campaigns. Most businesses use standard A/B testing to focus on subject lines, images, copy changes and other email revisions. Smart businesses don’t spend hours crunching numbers, but they make good use of their reporting dashboards. The test data helps them understand their prospects and improves their future marketing campaigns. Messages over 100K in size get blocked often. Aim for something in between 35k to 50K. Define alternative tags for images that include call to action. However, B2B marketing strategies are incomplete without email marketing campaigns. Successful email campaigns require very much more than ardent "batch and blast" efforts. By following the above tips, businesses will get to know their prospects better, increase their leads and boost returns on their marketing investments.